India is the home to a large number of indigenous people, who are still untouched by the lifestyle of the modern world. There are 461 tribes in India out of which 424 are considered as the Schedule Tribes. 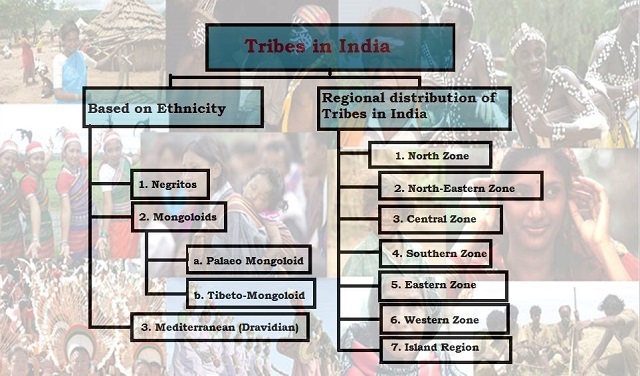 In this article, we are giving the names of tribal groups in India and their regional distribution that will helps the aspirants in the preparations of examinations like UPSC, SSC, State Services, CDS, NDA, Railways etc. India is the home to a large number of indigenous people, who are still untouched by the lifestyle of the modern world. Now the question is who are tribes or which people belongs to the tribal groups. In 1960, Chanda Committee determined five standards to include any caste or community in the tribal group. These standards include Geographical isolation, special culture, characteristics of tribes, backwardness and shyness. There are 461 tribal groups in India out of which 424 are considered as the Schedule Tribes. The tribes of the region of Jammu & Kashmir, Himachal Pradesh, Punjab, Uttarakhand, Sub Himalayan Uttar Pradesh, and Bihar come under this zone. They are Lahul,, Lepcha, Bhotia, Tharu, Buxa, Jaunsari, Khampa, Bhoksa, Gujjars and Kanauta. They all have the characteristics of the Mongoloids racial group. The major problems of the tribes of this zone are in accessibility, lack of communication, poverty, illiteracy and land alienation. These tribes have a very high rate of literacy and conversions to Christianity, mainly because of the missionary activities during the colonial rule. The tribes of Chhattisgarh, Madhya Pradesh, Western Rajasthan and northern Andhra Pradesh come under this zone. The major tribes of Chhattisgarh are Gond, Baiga, maria and Abujhamaria. They are largely concentrated in Mandla district of Madhya Pradesh, Bastar district of Chhattisgarh and also foun din the eastern region of Andhra Pradesh. They are the tribes of Central and Southern Western Ghats, who are expanded towards the south of 20 degree latitude. The tribes of Western Andhra Pradesh, Karnataka, Western Tamil Nadu and Kerala come under this zone. The most important tribes of the Nilgiri region are Toda, Kota and Bagada. The other major tribes of this zone are Kurumba, Kadar, Paniyan, Chenchu, Allar, Nayak and Chetti. The tribes of Jharkhand, West Bengal, Odisha and Bihar come under this zone. The tribes of Odisha are Juang, Kharia, Khond and Bhumij. The tribes of Jharkhand are Munda, Oraon, Santhal, Ho and Birhor. They are of the Austric language family and speak Kol and Munda languages. They are the tribes of Chhattisgarh, Madhya Pradesh, Western Rajasthan, and northern Andhra Pradesh. The major tribes of Rajasthan are Bhil, Garasia, Mina, Banjara, Sansi and Saharia; of Gujarat are Mahadeokoli, Bali and Dabala; of Madhya Pradesh are Jayanti. The tribes of Andaman & Nicobar and Lakshadweep groups come under this zone. The major tribes of Andaman & Nicobar are Shompen, Onge, Jarwa and Sentinali, who are gradually getting extinct. They are related to the Negrito racial group. All the racial groups are identified separately on the basis of their own racial characteristics. These characteristics are the nature and colour of hair, head structure, Nasal index and shape of eyes. However, the racial group groups in India are highly mixed. Next Story Which countries of the world do not impose income tax?